And from the mess of blood and viscera, there emerges the soul of a new machine. It moves in a herky-jerky fashion; a pair of dark orange eyes slowly light up, a few feelers twitch into motion. It's a mix of wires, bolts and circuitry. 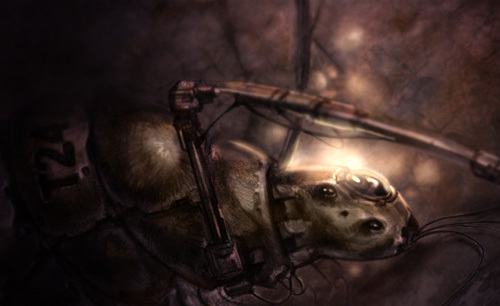 It crawls out from the organic wreckage, trailing various substances. It doesn't look back at its former host, which is making increasingly faint guttural sounds. Eventually the host falls silent. The drone lies very still. It's the size of a fist, which is typical of the lesser workers. Fighter drones may grow up to the size of frigates, but they need smaller entities like the workers to clean and repair them. There are no smaller entities than the workers, leastwise not autonomous ones. Workers are easily replaceable; they're not worth the effort of repairs. When one of them breaks, there's really nothing for it to do except fix itself, in whatever way it can. This drone is broken, and it hasn't been able to fix itself. It's lying on the floor of a laboratory, surrounded by all manner of scientific equipment. It's also lying in the middle of an expanding pool of blood, courtesy of its unwilling surrogate. After a few moments it makes a buzzing sound that's almost like a harrumph, shakes a few dark flecks off its metal carapace, and flies out of the room. Drones can operate at minimal capacity, diverting resources as necessary. This is even more important for the smaller ones, who don't always have access to repair facilities. When no healer is nearby, you apply a tourniquet to the wound and carry on. This drone, running only basic operational support, enters another room, flying through an open doorway. The door has been torn off its hinges and is lying to the side. Laboratory equipment is strewn all over the place; the drone hovers over broken glass, bent wireframes and various bits of circuitry. It trails a long series of cords, like the line at the end of a kite. The cords are interwoven with thinner strings, some biological - remainders of its former host - and some metallic, crackling and sparking as they brush against the metal debris on the floor. The drone doesn't seem to notice. There is a small series of red LEDs on the underside of the drone. They start blinking, slowly. The drone is telling the world that it is becoming operational. In the piles of broken equipment it comes to a single beaker, untouched and unbroken. Extending one pincer, it hovers closer. The pincer closes its metal fingers around the undamaged beaker and slowly lifts it from the ground for further inspection. The beaker is empty, but has been spattered with some mixture of white and red. The drone tries to bring it closer, but exerts too much force on the beaker, and it breaks. The drone trembles. It was hoping that this time around, it would be reborn whole. It has tried so many times to fix itself. Satisfied, at least, that its LED heartbeat is regular, it decides to ignore the broken beaker. It is only to be expected that a newborn would be a little clumsy. That's how it works. Then you grow, and you mature, and you heal. You don't have to live with being a broken, malfunctioning piece of malevolent creation. The drone flies into the next room. This one is fairly hard to navigate through; the gas fumes that leak from broken pipes are obstructing the view. The drone diverts a little power to its processing equipment. Tiny fans in its intake valves spin into action, and a portion of the gas is sucked in. The drone doesn't analyze it, nor use it in any way; it simply ejects it again. Intake, eject. Intake, eject. Inhale, exhale. Its lights flicker in a quick smile. The drone doesn't spend too much time in that room. It can feel the gas settling on its outer surface, and it doesn't want everything to get clogged up. There's a box nearby containing bottles of various sizes. It flies head-first into those, breaking them, and grinds its carapace into the resulting puddle. The glass doesn't scratch it, nor does the mixture of acids it's rolling in, and eventually the drone is left covered in a sticky substance that protets it from the gas. Its body trails tiny filaments that have hardened in contact with the air, like hairs on a corpse. The drone tries to remember a time where its mind wasn't on fire, a jumbled mess of half-thoughts, conflicting sensory inputs and endless loops of noise and electrical static. Every time it shuts down and begins again, it hopes that things will be put right. Every time. It flies close to the ground to avoid accumulating too much of the gas. On its way through, it bumps into an inert body. It stops, thinks, then extends its feelers and grabs hold of the white lab suit in which the body is clad. It pulls. The robe shifts a little, but no more. It pulls harder. The robe shifts more, but so does the body. The drone tires of this. A tiny hole opens just below its eyes, and a laser beam briefly shines through. There is a wet sound, and a burning smell. The drone pulls again. This time, the robe comes off. It flies through the second room. Once it's out, it uses the robe to wipe the accumulated patina off its body. It inspects the crud: it's a white, thick but slightly frothy material. The drone allows itself a brief moment of chemical analysis, and sees that the stuff is called Vernicium. It's a byproduct of various chemical processes, and rather destructive to human skin but perfectly safe to metal. A scream from the gas room startles the drone into action: it turns immediately and fires the laser randomly into the murky cloud. There is a thump. The drone hovers for a moment, then turns again and keeps on going, into the third room. It decides to start powering up all its internal operations, its metal organs. All senses are now working, some of them a little too well. Tiny drops of oil start accumulating on the drone's carapace, trickling into the hairline cracks that circumscribe its optic cameras. The drone turns its internal thermostat up to the maximum it can stand, and its outer surface burns off both the oil and the chemical filaments accumulated in the last room. The filaments fall off and land in a heap on the floor. It tests the other senses. It can detect the gaseous traces coming from the other room. Good. Zoom and unzoom works as well; it can count the ridges in a pen that's lying on the floor. It can sense audio waves as well. It picks up one now. Coming from a nearby cupboard. The drone turns and slowly flies in the direction of that cupboard. The sound from the other side is quiet, very quiet. It's someone breathing, in a staccato rhythm. Gently, the drone nudges open the cupboard door. Inside, it sees a young woman, dressed in a lab coat. The woman's eyes are red-rimmed, and she's mouthing silent words. The drone hums with something resembling pleasure. It revolves silently in the air so that its head faces downwards. Its feelers shoot out like pythons and fasten the woman to the wall by her head and shoulders. Two pairs of feelers clamp on to her jaw and pry it open. The drone has been trying to fix itself, trying to re-make itself into an undamaged creature. But it has been running out of hosts. Now it has found one. And her face is open to let it in, to let it be born again.